Yes, there are two sort of. 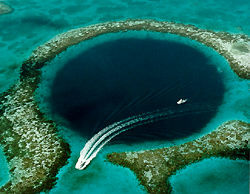 (https://ambergriscaye.com/pages/town/greatbluehole.html) is a feature attraction of scuba diving in Belize, Especially for divers with a appreciation of geographical phenomena, is the opportunity to explore the famed Blue Hole. Part of the Lighthouse Reef System, it lies approximately 60 miles off the mainland out of Belize City. It is one of the most astounding dive sites to be found anywhere on earth, right in the center of Lighthouse Reef is a large, almost perfectly circular hole approximately one quarter of a mile (.4 km) across. Inside this hole the water is 480 feet (145 m) deep and it is the depth of water which gives the deep blue color that causes such structures throughout the world to be known as "blue holes." Like a giant pupil in a sea of turquoise, The Blue Hole is a perfectly circular limestone sinkhole more than 300 feet across and 412 feet deep. The array of bizarre stalactites and limestone formations which mould its walls seem to become more intricate and intense the deeper one dives. Near to The Blue Hole, one of Belize’s largest protected areas, Half Moon Caye Natural Monument, encompasses 10,000 acres of the atoll and 15 square miles of surrounding waters. The diameter of the circular reef area stretches for about 1,000 feet and provides an ideal habitat for corals to attach and flourish. The coral actually breaks the surface in many sections at low tide. Except for two narrow channels, the reef surrounds the hole. The hole itself is the opening to a system of caves and passageway that penetrate this undersea mountain. In various places, massive limestone stalactites hang down from what was once the ceiling of air-filled caves before the end of the last Ice Age. When the ice melted the sea level rose, flooding the caves. The temperature in the Blue Hole at 130ft is about 76F with hardly any change throughout the year at that depth. For all the practical purposes the over 400-foot depth makes the Blue Hole a bottomless pit. The walls are sheer from the surface until a depth of approximately 110 feet where you will begin to encounter stalactite formtions which actually angle back, allowing you to dive underneath monstrous overhangs. Hovering amongst the stalactites, you can’t help but feel humbled by the knowledge that the massive formation before you once stood high and dry above the surface of the sea eons ago. The feeling is enhanced by the dizzying effect of nitrogen breathed at depths. The water is motionless and the visibility often approaches 200 feet as you break a very noticeable thermocline. The Blue Hole National Park (https://ambergriscaye.com/pages/town/parkbluehole.html) is right next to the Hummingbird Highway. There are two access points, the visitor centre/parking area for Herman’s Cave, and the lay-by just above the Blue Hole. The two are only a mile and a half apart. The National Park is just 12 miles southeast of Belmopan (on the right coming from that direction), and can easily be reached by bus. Tours also run from San Ignacio and Belize City. Exploring the park takes about half a day. The park has a lot to offer. Adjacent to a parking area, steps lead to the pool that gives the park its name (not to be confused with the other Blue Hole on Lighthouse Reef. The stairway leads down through the forest, and birds can often already be seen resting on over-hanging vines, especially emeraldgreen Jacamars and Blue-crowned Motmots. Also took out for the Scarlet-rumped Tanager and listen for the Nightingale Wren. Another common bird around the Blue Hole is the Long-tailed Hermit, a mainly brown hummingbird with white tail, which often dips into the water for a quick drink. Back in geological time, the pool itself was a stretch of underground river cave, but it lost its cover when the roof collapsed. Since the Hummingbird Highway was built, it has been a favourite swimming spot, with refreshing cold water. If you have a snorkel, bring it so you can peer down into the eerie blue cavern where the water comes from. The strearn carries on about 40 yards before descending down a siphon through an echoing cave full of bats (and a few Cliff Swallows in the winter months), and later on re- emerges to join the Caves Branch River. If you’re coming from Belmopan, you will already have driven over it. The surrounding limestone is full of caves, and it was only by tracing coloured dyes that it was ever discovered that this was the hydrological connection. The other park features which offers a respite from the heat is St. Herman’s Cave. It’s another part of lattice of sink holes, caverns and creeks that riddle the area. Its relatively small opening is draped in lianas, but steps are provided to descend into the dark interior. If you bring a torch and go with a guide, the cavern can be followed for almost a mile. The trail then emerges and loops back through the forest to the starting point. You can admire the delicate cave formations, but as the stalactites and stalagmites take about 800 years to grow an inch, definitely don’t touch them. Posted : Marty Casado - Thu, Dec 7, 2006 12:01 AM. This article has been viewed 10457 times.